On the evening of 29 April, 1853 Maurice Dalton, a former publican, attempted to gain entry to Freeman’s Public House in Mudgee. After being refused entry by the owner Freeman, Dalton threw a large stone into the building. He then crossed the street where he came upon a man named Brandon who was playing a clarinet. Dalton knocked Brandon to the ground, asking him what business he had playing the instrument. Brandon then went and reported the incident to Constable Oxley. A short time later Oxley located Dalton and asked him, “Is that you, Maurice Dalton?” Dalton replied, “Who are you?” and then went on, “Oh, I know you for a b—– trap by your buckle.” He then struck Oxley a severe blow to the side of his head with a large stick, knocking the constable to the ground. He then kicked the fallen constable as he lay on the ground. The constable joined the police force in June, 1851. At the time of his death he was 49 years old and was stationed at Mudgee. SERIOUS CHARGE AGAINST A PUBLICAN.- In the month of April ultimo, Maurice Dalton, a publican at the Maitland Bar, on the Turon, was committed for trial by the Mudgee Bench of Magistrates for assaulting a policeman named Oxley. Mr. Dalton was admitted to bail, but as the case assumed a serious aspect, and Oxley has died, Mr. Dalton’s sureties surrendered him to the Gold Police, from whom he effected his escape, and is still at large.-Empire, May 30. MURDER. – A man named Maurice Dalton was placed in the dock by Sergeant McGhee, charged with having committed a violent assault on Constable Oxley, of the Mudgee Police, from the effects of which the constable had subsequently died. The offence was committed in the month of April last, near Bathurst, and prisoner was apprehended on a warrant from the Mudgee Bench, which had since been sent to Port Phillip, where it was supposed he was residing. The prisoner denied the charge laid against him. At the request of Mr. Wearin, he was remanded till this morning. MURDER AT MUDGEE. — Maurice Dalton was again placed before the Court. A witness named Hugh O’Donnell deposed, that he lived some time since at Mudgee, and knew a person named Maurice Dalton ; witness did not believe the prisoner was the same man ; if so, he had very materially altered in appearance. Sergeant McGhee produced the Hue and Cry, wherein, under date 28th April, 1853, was given the description of a man named Dalton, charged with a violent assault on Constable Oxley, from the effects of which the latter afterwards died. The description published corresponded exactly with the personelle of prisoner. A letter was found on the defendant, having reference to the alleged assault. Their Worships, after consultation, remanded prisoner to the Mudgee Bench for examination. On Friday the 27th ultimo, Maurice Dalton, who had been apprehended in Sydney for the murder of William Oxley, one of our constables, in May last, was brought into our township and safely lodged in the lockup. MAURICE DALTON — This somewhat notorious individual was forwarded from Bathurst to Mudgee about a fortnight ago, to be present at the investigation touching the death of the policeman who fell by his hands, at the last Mudgee races. He was fully committed to take his trial at the forthcoming assizes for an assault resulting in the death of the attacked, and reached Bathurst on Monday last. Maurice Dalton was indicted for that he, on the 29th April 1853, at Mudgee, in New South Wales, did feloniously, wilfully, and of his malice aforethought, kill and murder one William Oxley. James Lucas Brandon: I live at Mudgee ; I lived there in April last ; I saw the prisoner on 28th April ; he insulted me, and knocked me down ; I was going home, playing the clarionet, when the prisoner came across and asked me what business I had playing that bloody thing, and knocked me down ; I went to constable Oxley, and told him, and he told me to go home ; when I got home I heard stones thrown against my hut ; I was frightened to stop, and I went out for constable Oxley, and then I saw the prisoner : Oxley spoke to prisoner, and asked what he was about, kicking up that row at that time of the night for ; prisoner asked him who he was, and said, I know you are a b—dy trap, I know you by your buckle ; I then saw Oxley fall, no one was near him when he fell but prisoner ; I was 100 yards off ; I could not say whether prisoner had a stick or a stone in his hand ; when Oxley fell I went up to him, and found him bleeding profusely from a cut on the head, he was not able to speak, he appeared to be insensible ; I think Oxley lived for a month afterwards. Cross-examined by Mr. Holroyd : After he was knocked down, and before his death I often saw him on duty in the streets of Mudgee ; I had been playing the clarionet in Tuckerman’s public house, in Mudgee. I drunk nothing that day but peppermint and ginger beer – three glasses of port wine in the evening. William Freeman : I live in Mudgee ; I recollect 28th April, 1853 ; I recollect seeing prisoner that night ; he used to keep a public house at Maitland Bar ; on that night I was called up by the mistress, who said some one was breaking into the house ; I went outside and found prisoner there ; I told him to go away, but he would not go away ; I then went back to my house and he followed me round and threw a large stone into my house, which fell on my wife and child ; I spoke to him, about throwing the stone, and he then went away ; I saw him then walk towards the witness Brandon, who was coming down the street, and I saw them scuffling, and Brandon called out for Oxley ; I afterwards saw Oxley bleeding about the head, about half an hour after I saw prisoner scuffling with Brandon. Cross examined by Mr. HOLROYD; He had no stick in his hand after he threw it on my wife’s bed. Donald McDonald ; I am a surgeon, I knew the late William Oxley ; I was called to see him in the morning of 29th April, 1853 ; he was lying on his bed, bleeding-profusely from a cut on his head, it was a contused wound such as might have been caused by a stone ; he lived eighteen or nineteen days after I first saw him ; I made a post mortem examination ; I should say that his death was caused by the injury received on his head ; I knew deceased for several years, he was a healthy man ; the scalp was inflammed, and on opening the cranium I found the membranes of the brain were inflammed, caused by the wounds ; other causes might have accelerated his death. Cross-examined by Mr. HOLROYD : I think the wounds were sufficient to cause death ; I believe deceased was a free liver, and had the appearance of a man that drank ; I saw deceased do duty as a constable ; I cautioned him not to drink ; I believe but apoplexy was caused by the blows on the head. David Picton: I live at Mudgee ; I recollect the night Oxley was wounded ; I saw a man near Brandon’s, house ; whilst I was in Brandon’s house two stones were thrown in ; Brandon then went to Oxley for assistance ; Oxley went up to the man and said, “Is that you, Maurice Dalton?”. Prisoner said, “Who are you?” and then said “0, I know you are a bl–dy trap, by your buckle” and struck him a blow with a large stone. Oxley fell when he got the blow ; I helped Brandon to pick him up. Cross-examined by, Mr. HOLROYD : I was 20 yards off Oxley when the blow was struck. .
John Ashton : I am a constable in Mudgee ; I knew the deceased, I recollect his meeting with this injury ; I know that he had fits ; he had one on 26th February last year between the time of the accident and his death ; he went on duly 12 miles from Mudgee ; he went on horseback ; this was about 15 or 16 days after he received the injury. The first time I saw him in a fit was on 26th February last year ; I don’t know what caused the fit ; I never saw him have another fit ; he appeared a very healthy man. George Taylor ; I am an innkeeper at Mudgee ; I knew Oxley the deceased ; I recollect his taking a journey to Cloudy Bay ; after his return from Cloudy Bay, I saw him in a fit ; this was in the morning ; I saw deceased lying in a fit on the ground ; I assisted him by lo? ?ing his handkerchief, and then went for the doctor ; he was very apoplectic looking ; I saw him occasionally on duty from the time of the assault to his death. Cross examined by the ATTORNEY-GENERAL : He went to Cloudy Bay some days after he got the wound ; it was not quite healed. Alexander-Watt : I knew the prisoner whilst he was in my employment ; he was a very well behaved man. Cross-examined, by the ATTORNEY-GENERAL ; It is ten or twelve years since he was in my service ; he was a few weeks in my service employed mowing. The ATTORNEY-GENERAL replied at some length. WILFUL MURDER Maurice Dalton was indicted for the wilful murder of William Oxley on the 29th April last, at Mudgee. He pleaded not guilty and was defended by Mr. Holroyd. Attorney — Mr. Serjeant. James Lucas Brandon deposed that about 1 o’clock of the morning of the 29th. April, he was proceeding homeward, playing a clarinet, when the prisoner walked up to him and after asking him what he wanted playing that b____y thing, knocked him down. He applied to constable Oxley for assistance who advised him to go home. He did so, and shortly afterwards stones were thrown at his door and upon the house. Again he went for Oxley for assistance who came out, and no sooner made his appearance than the prisoner accosted him in these words— “you’re a B____y trap, I know you by your buckle.” Upon proceeding to the spot he found deceased lying senseless and bleeding, the wound having been inflicted on the side of the head. Cross-examined by Mr. Holroyd. He frequently saw the deceased upon duty afterwards in Mudgee— never saw him the worse for liquor, but recollected taking a glass with him on the Thursday before his death. William Freeman saw the prisoner at Mr. Arthur Cox’s on the 29th April last, who was making a great noise. He ordered him away and was requested by him not to tear his shirt. In a moment afterwards prisoner seized a big bludgeon which he threw inside upon the bed in which his wife and children were sleeping. At this time the prisoner had a stone in his hand. He saw the deceased who was capable of walking unsupported. Dr. Macdonald attended the deceased who had a wound upon the side of the head, which did not appear to he dangerous. Besides this he subsequently discovered, when holding a post mortem examination upon his body, another and more serious wound at the back part of the head, but from which no external injury appeared. He had no doubt but the blow’s accelerated, if they did not cause his death. There was a considerable effusion of blood upon the brain. Cross-examined by Mr. Holroyd : He did not know that the deceased drank, but he had the appearance of a free- liver. He saw deceased a few days before his death and heard of his falling over a scraper. From that period he had a succession of apoplectic fits which continued until death. David Picton saw a man whom he did not know to be the prisoner near Brandon’s, at whose house he threw two stones. Shortly afterwards he saw Oxley leave his house and heard him speak to this man whom he named Dalton, and who in reply called him “b___y trap” ‘ A moment or two afterwards he saw Dalton strike deceased with a thick stick which felled him to the earth : blood flowed freely from the wound thus caused. He (witness) might be 20 yards from them at the time Brandon and he stood near each other. Mr. F. Bailey proved that a charge for a violent assault was preferred against Dalton who was committed to take his trial at the Quarter Sessions on the 30th. January. Some time afterwards Oxley died and an inquiry was held upon his remains. The depositions were written by him as Clerk of the Court at Mudgee. This evidence closed the case for the Crown. Mr. Holroyd addressed the jury in behalf of the prisoner. This case, he said, involved a charge of murder without malice, as from the evidence which had been given it was impossible to conceive that the prisoner could have been actuated by any such feeling. There was nothing before the jury to show that they were even acquainted, and from the nature of the wounds the blows must have been of a very trivial character. When the witness Freeman reached deceased he was standing upon his legs, and could not therefore have been very seriously wounded. There was moreover a discrepancy in the testimony of Picton and Brandon which showed plainly that both could not speak truth. The former estimated the distance at which they stood at the time the deceased fell at 100 yards, whilst the latter fixed it at about 20. Clearly this was no case of murder, and he could not for one moment imagine how it was to be reduced even to manslaughter upon such trumpery evidence. According to Dr. Macdonald’s testimony the deceased had a predisposition towards apoplexy, and this predisposition was increased by ardent spirits of which it appeared probable he partook. It would also be fresh in the recollection of the jury that the deceased had fallen against a scraper a few days before his death, and had then most probably received the injury at the back of the head which caused apoplexy and hastened his death. To his mind it appeared that an assault was the worst charge that could be fixed upon the prisoner. He then called Constable Ashton of Mudgee who knew the deceased and remembered that on the 26th. February 1853 he had a fit about 7 miles from Mudgee, and was insensible for about three quarters of an hour, but had never seen him in one before nor since. Witness attributed his illness on that occasion to the fact that they had been travelling all day with a flock of sheep, and deceased had not broken his fast. About 16 days after the assault deceased was on duty and went with a letter for the coroner to Cloudy Bay, and did not return until the following day. Mr. George Taylor, Innkeeper of Mudgee, remembered deceased’s going to Cloudy Bay in the early part of May in last year ; it was after the assault — had never seen him in a fit until he returned from Cloudy Bay. On the morning after his return, heard some one screaming, and on going out saw deceased on the ground in a fit – knew that he had been on duty occasionally after the 29th. of April. Cross- examined, by the Attorney-General : The wound in the head was not quite healed at the time he went to Cloudy Bay and witness thought he was not able to do as much duty as before the assault. He did not appear to suffer from any other cause than the wound in the head. Mr. Alexander Watt was called to give the prisoner a character. He said he had known him for ten or twelve years, and on one occasion had employed him during the harvest — had also heard other persons speak of him, and believed that when sober, he was quiet and well behaved, but when in liquor very violent. Beyond this he did not know very much about him. The Attorney-General replied and made some stringent remarks about gentlemen appearing to give prisoners a good character of whom they know but little, the natural consequence of which was that the cases of those who really deserved a good character were materially injured. In reference to the case before the court he cited some cases to show that it was a matter of no importance whether the deceased was aged and infirm, or young and strong, but if his death was accelerated by the conduct of the prisoner the charge against him was sustained. He also directed the attention of the jury to the expression used by the prisoner at the time of the assault calling deceased a “B___y trap” &c., kicking him after he had knocked him down, and said if deceased had drunk too much or taken too much exercise after the assault it would not make an atom of difference ; for Dr. McDonald had declared that death had resulted from the effects of the blows upon the head. His Honor, in summing up, laid before they jury very clearly and distinctly the difference between murder and manslaughter, and said that in cases of homicide the law presumed the existence of malice ; and it was for the defendant to show that he had just cause for his conduct in the affair. After reiterating the evidence he left the case in the hands of the jury. The jury found a verdict of manslaughter. Prisoner who was remanded for sentence. THE ATTORNEY-GENERAL AND THE MAGISTRACY. This, he said, was one of the many instances which had recently come under his notice of individuals being intrusted with a publican’s license who were most palpably and flagrantly unfitted for such a position. Here was a man arraigned for the wilful murder of a fellow creature – a murder committed whilst in a state of maddening intoxication, who by some means or other had obtained a license as a publican. And how came this? Would it not be quite as safe, nay infinitely more so, to place deadly weapons in the hands of a maniac and turn him loose upon society, than to intrust a person of bad moral character, and a notorious drunkard to boot, with the power and opportunity of inflicting such a vast amount of mischief upon the community. Only that very day it had transpired in evidence upon another case that the prisoner had been a publican at Carcoar, and was known to the bench to be an habitual drunkard. Nay, one of the magistrates himself who appeared as a witness had admitted that when he called to see him about the money which he was accused of stealing, he was so drunk as to be unable to speak sensibly and that he never saw him sober ; yet, notwithstanding these facts, known personally to himself, and occurring under the very nose of the Bench, his license was subsequently renewed. What security, he would ask, could there be for the preservation of public order and against the commission of crime whilst magistrates thus culpably neglected their duty? One bad man invested with the privileges and opportunities of evil which appertained to such a calling, could accomplish a vast amount of mischief in promoting and fostering vice and crime, and in aiding in the demoralization of those by whom he was sure to be surrounded. It would be better to arm a madman with a firebrand and trust to consequences, than enable a person so devoid of character and principle to scatter about him the moral poison of his depraved nature. The frequency of late of such cases as those upon which he was now commenting impelled him thus publicly to call attention to the circumstance. And he must say if magistrates tolerated such evils by neglect of duty, they were responsible for the consequences. And herein principally lies the misfortune. Similarity of tastes and disposition surrounds such men with the criminal and the vile. At such houses their depredations are planned, and there the wages of crime are dissipated. Money thus easily earned is recklessly squandered, and heedless of the source whence it has been procured, if not directly concerned in the plans of his rascally associates, the unprincipled tapster grows fat upon the spoils which have been wrung from the honest and unwary. There sins and malpractices are, therefore, not only connived at, but encouraged. They form a perennial spring of profit whose amount is not to be despised. True to one instinct of our natures, where better sentiments are inoperative, he sells his grog, pockets their ill-earned cash, and ask no questions. To him the clever and successful thief is worth infinitely more as a customer than twenty honest and reputable men, and hence such company is infinitely preferred. The wealth of a plundered community flows into his pockets, and for this consideration he is ready to administer in any shape to the base ( and brutal passions of his customers. The above may be an extreme case, but there are many which differ only in degree. Men of loose or unfixed principles are not apt to be over-scrupulous where business is to be done. The tap runs freely whilst the cash is responsive, and under such circumstances little heed is taken of irregularities, improprieties, or the Licensed Victualler’s Act. The free and easy style of such establishments suits the tastes of the reckless and the profligate ; and hence it ¡s that the respectable publican, whose regard for his own character and the reputation of his house will not permit any gross violation of law or decency, is most materially injured. But we are very far from imagining that the rapid strides by which intemperance is stalking over the country are to be stayed by the most active magisterial superintendence. The root of the evil lies out of the reach of all law – beyond the grasp of the most vigilant police. To read lectures to the magistracy will do little towards the correction of an evil which has eaten its way into the very vitals of our social system, and overshadows the land with gloom. All the powers of legislation and machinery of our courts of justice are unequal to the task of eradication. Society must expurgate itself, and it can only do so by the universal action of some powerful moral agency. No class is free from the taint of this cankering vice, and sermons upon temperance delivered to the masses will be of little force or efficacy whilst the power of example is wanting in the ranks of those who claim the right to sermonize. It is true that much crime and irregularity might be prevented by a stricter exercise of the discretionary power vested in the magistracy, but the public may fairly share the blame of recklessly licencing all applicants. No matter what the character, five respectable householders will be found to parade their names in the way of recommendation, and it is notorious that profit has often more to do than principle with the matter. In this manner men of indifferent or bad repute have passed through the magisterial ordeal into a public-house, and have thus visited one of the sins of the community upon its own head. First – Mr. So and so, storekeeper, signs, because he is anxious to secure a customer, and uses his influence with a friend or two. Several good names being already attached, they become a guarantee of the applicant’s eligibility for a license. Others are therefore easily obtained, and the bench by no means unwilling to forego the trouble of an inquiry which promises more kicks than half-pence, take it for granted that the applicant is what he is represented to be. The learned Attorney-General could therefore have very well afforded to give his castigation a much wider amplitude. Maurice Dalton, manslaughter, was sentenced to five years hard labour on the roads or other public works, the two first to be worked in irons. He presented a petition to his Honor setting forth amongst other things that his victim had died from the effects of falling upon the scraper, but this his Honor stated to be impossible, the wound behind the head was caused by a blunt not a sharp instrument, a fact which was established by the circumstance that the skin was not cut outside. His conduct he said had been most savage and unprovoked and he would mark it by very severe sentence. It has been revealed that this person is NOT mentioned in the States Honour Roll nor the National Honour Roll of Fallen Police. 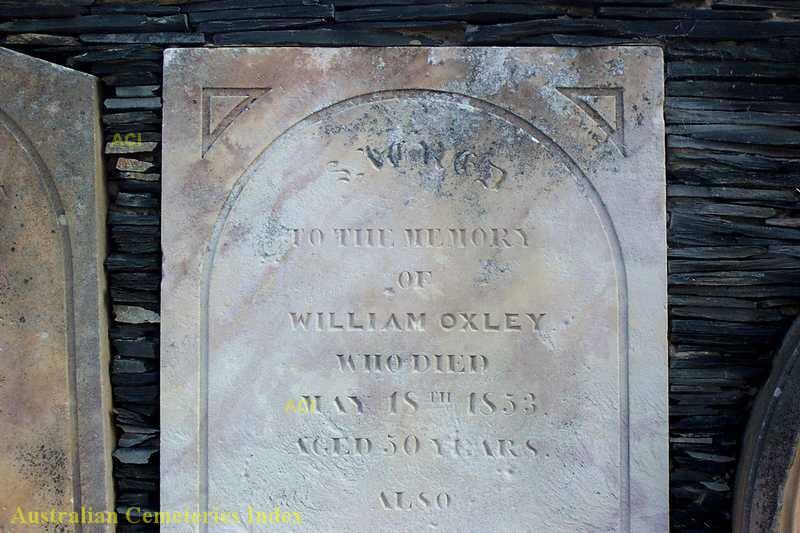 It has come to my notice that Constable William OXLEY, killed as a result of work related assault, who died on the 19 May 1853, is NOT mentioned in the National, nor NSW Honour Roll. I have listed all the relevant newspaper articles of the time, in relation to the matter and it is shown that the offender ( Maurice Dalton ) was finally convicted of the Manslaughter of Constable William OXLEY who is buried at the Mudgee Pioneer Park.